Ubuntu 8.04 was released a few days back and like the previous releases of Ubuntu,Ubuntu 8.04 does not include a number of essential codecs, applications etc because of number of licensing restrictions and also the limitation of accommodating more and more applications on a single CD. Though undoubtedly Ubuntu 8.04 is one of the most user friendly release of Ubuntu with inclusion of Firefox 3 (though it is beta version but still is way better than the current stable version of Firefox) ,inclusion of bit-torrent client , out of box support for playing youtube videos etc . Still someone trying to make the jump from Windows to Ubuntu might be interested in installing the following applications and codecs too . Launch Synaptic Package Manager (System -> Administration -> Synaptic Package Manager ) , then in Synaptic package manager go to (Settings -> Repositories ) you will find window like this . Ensure that all the check boxes are marked leaving source code(if you want to you can enable this also but you are not going to need this unless you are software developer) the dialog box should look like this . Uf you have followed the above steps properly your repositories should be in order for following the steps below . Note : It has been reported that Real player is not working properly :( i would update these instruction once i figure out solution to the problem . 7. Firefox 2 Anyone ??? 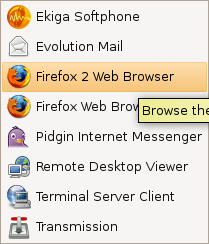 after issuing the above command go to (Applications -> Internet -> Firefox 2 Web Browser ) to launch Firefox 2 . Firefox 3 Beta 5 and Firefox 2 installed simultaneously . Even if you hate Microsoft Windows still majority of desktop computers around the world run some or other variant of Windows . Now sharing documents , web pages across Linux and Windows is bit difficult as document created in Windows do not render properly/or look as they did in Windows because the fonts which were present in windows are not available in Linux . 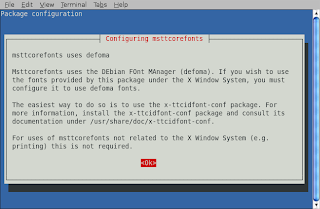 Now even though Microsoft has released these fonts freely but still because of licensing issue most of the Linux distributions do not ship these fonts by default and you have to install them separately. After clicking the Ok button , you will find the following screen showing the fonts are being downloaded . if the above steps worked without any problem the font should be installed properly on your system . aMSN is a MSN Messenger clone for Linux operating system , it tries to emulate look and feel of MSN messenger as close as possible allowing linux newbies to use aMSN easily . aMSN has features not present in MSN Messenger. Users can set alarms, are able to see others who have removed them from their contact list, and are able to open many profiles at once. It is also very customizable, with extensions and themes available at the main site. CheckGmail is a nifty little gadget/widget that sits in your taskbar and once configured automatically informs you whenever you receive new email in your GMail Inbox . VLC Player is another of popular video player available under Linux . It is released under GNU General Public license and is available for different platform including Windows,Linux,BeOS,Mac OS X etc. VLC player is based upon free open source libraries like libdvdcss,FFMpeg for decoding various video formats.One Important feature of VLC Player is it's ability to play files over NetWork Protocols. The Frontend of VLC player is created using wxWidgets toolkit and it's appearance can be changed by using different skins. One Popular feature of VLC Player is it's ability to play files that are incomplete/broken or partially downloaded , making it useful for previewing file while downloading on file-sharing networks. Audacity is open source cross platform software for recording and editing sound files . 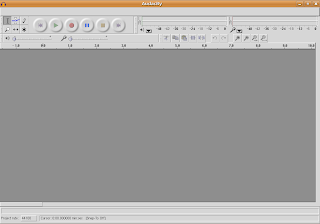 The Graphical interface of Audacity was created using wxWidgets library . The ability to make precise adjustments to the audio's speed, while maintaining pitch, in order to synchronise it with video, run for the right length of time, etc. Nice post! I plan on doing most of those things as soon as I have time. I think I might have read that gnome now has it's own basic compositing. I don't know how to enable it but I think you can use it run awn. I can't wait to try that out because my computer is a little bit too slow to run compiz smoothly. when upgrading 3 import 2's configuration and destroy it definitively: no profile backup? no party! we waited 6 months to have openoffice updated to stable release, and they force you to use a stupid beta with almost no extra features? if you don't like firefox don't use it. Though honestly, I'd rather use firefox than Internet explorer anyday. Maybe mepis is better for you, maybe it's better for others, but that's why there are different Distributions. I don't necessarily agree with it but as I understand it the reason they chose Firefox 3 beta rather than Firefox 2 is because this is an LTS release and over that time Firefox 3 will be support by Mozilla whereas Firefox 2 will probably be ended. This is just what I read on Slashdot though, so don't take it as necessarily correct. I imagine that in a few weeks the main extensions will be running under FF3. In the meantime you can install FF2. As for the extensions, there is a tool called "Nightly Tester Tools" which helps in allowing some extensions to work until they are "officially" supported. It's what I used and it worked well. Also I upgraded my 7.10 using the built-in upgrade with the package manager. Did ok but many of the codecs don't work can't play dvd's and I have tried to reinstall them but they say they are already there. Had to manually remove firefox 3 to get firefox2 on there. The only way to do it was manually place firefox 2 by hand. If I tried using synaptic it would still come up as firefox 3 regardless of if I specified the firefox 2 or not even after I had removed firefox 3. Firefox 3 at this point is horrible and loaded with problems. THey also default to the most rediculous encryption certificate policy blocking all non top tier certificate makers and all user signed thus forcing everyone to pay for the ridculously expensive encryption certificates which in practice provide no real improvement in protection. Have yet to try a fresh 8.04 install. Very disgusted with the upgraded system. Ubuntu continues to put out the gFTP with sftp secure encrypted ftp removed from the distro. So you have to go into synaptic and lock their gftp and then go download gftp source and compile it to get the full functioning gftp. I'm really sick of this... no you can't just stick in the deb package for gftp as it has cross over dependencies (one package needs another pakage that needs it) and in Hardy they have removed the ability to not check for dependencies form Kpackage or any other method that I can find. 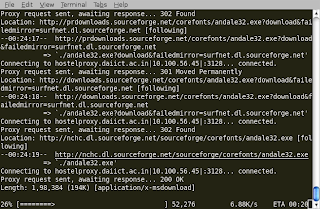 But thankfully gftp compiled works great with sftp. Hence no reason they are removing it other than to just cause massive problems. This is one of the best guides I've ever seen so far! Thank you! Very helpful! Keep up the good work!! As Pace said (4 posts back) the "Nightly Tester Tools" allows you to maek Firefox-2 extensions declare themselves to be "compatible". At which point, they might actually BE compatible -- or they might not ;). Be sure to get the "full" version of NTT, not the "light" version. If your fav extension does not work with FF3 then get nighty tester tools while logged into mozilla adds. Thanks a bunch. Bookmarked it! just wanted to say thanks...don't normally reply but I have been working on this for 3 days straight now, googling solutions and you were the only one who actually knew what you were talking about! I have just read through this page and though I'm sure all of these steps would improve my use of Ubuntu, this is far too complicated for the average guy. For example, how do you follow the steps outlined and paste in the codes without having two computers up and running? PS Even posting this comment was over complicated.